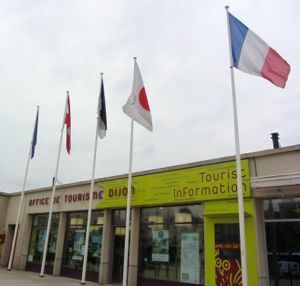 Two main offices make it easy to get tourist information in Dijon. Dijon has two Tourist Offices, one in the center of town and one at the train station. If you arrive by train, exit the station and look to your right for a row of flags (map). That's where the Tourist Office is, and they can provide you with maps and other helpful information. 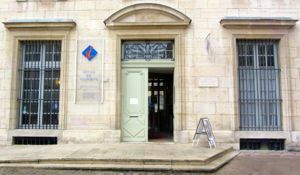 If you're in the center of town, the main Tourist Office is at 11 Rue des Forges, which is actually the back part of the Palais des Ducs de Bourgogne (map). The Tourist Office sells a small guide to the Owl's Trail, a self-guided walking tour of Dijon. The Office also sells tickets for those who want to climb the Tour Philippe Le Bon, and the visits start from the main office. And the Dijon Tourist Office is also the access point for the lovely Chapelle des Élus. This small chapel is often overlooked by tourists, but it is well worth a visit. Above and Left, Dijon Tourist Information Offices.